^ R. Douglas Francis; Richard Jones; Donald B. Smith. Journeys: A History of Canada. Cengage Learning. 2009: 51. ISBN 0-17-644244-8. ^ Estimated population of Canada, 1605 to present. Statistics Canada. 2009 [August 26, 2010]. ^ David L. Preston. The Texture of Contact: European and Indian Settler Communities on the Frontiers of Iroquoia, 1667–1783. U of Nebraska Press. 2009: 43. ISBN 978-0-8032-2549-7. ^ John Powell. 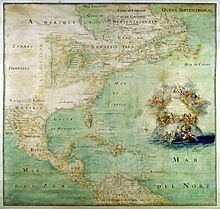 Encyclopedia of North American Immigration. Infobase Publishing. 2009: 203. ISBN 978-1-4381-1012-7. ^ Ronald J. Dale. The Fall of New France: How the French Lost a North American Empire 1754–1763. James Lorimer & Company. 2004: 2. ISBN 978-1-55028-840-7. ^ John E. Findling; Frank W. Thackeray. What Happened? : An Encyclopedia of Events that Changed America Forever. ABC-CLIO. 2011: 38. ISBN 978-1-59884-621-8.